Lightweight Lighthouse Handheld particle counters feature 0.2, 0.3 and 0.5 µm sensitivities and are the most advanced handheld particle counters on the market. 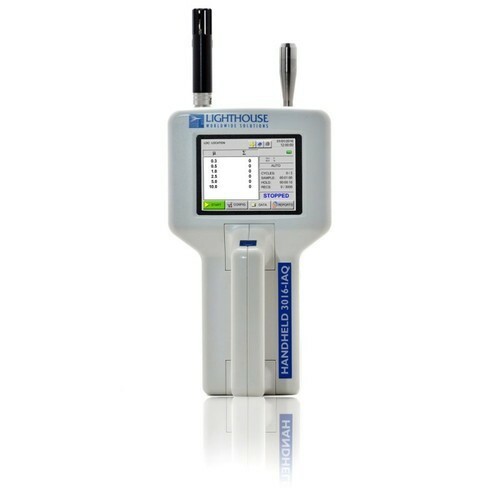 Lighthouse Handheld particle counters can display cumulative and differential particle count data as well as temperature/relative humidity data on the fast and easy to read colour touch screen. The Handheld can hold up to 3,000 records of particle data and store up to 50 recipes for sampling and reports. Removable batteries and an optional charger maximize uptime. 14 - 122 deg. F (10 - 50 deg. C) / 98 percent noncondensing max.